Place 2 cups of dried coconut flakes into food processor and process for ten minutes, scraping down sides as needed. Coconut will become soft and moist (you will have coconut butter). Scrape down sides and add in maple syrup, vanilla, and salt. Process until mixture forms into a ball. Place mixture in a large bowl and add in the final cup of dried coconut, use your hands to incorporate. Scoop out one tablespoon at a time and from into balls between the palm your hands. Place balls on parchment lined baking pan and place in fridge for 30 minutes to and hour or until balls are firm. Melt chocolate slowly in a stainless steel bowl over simmering water, stirring gently until completely melted and smooth. Roll balls in melted chocolate until completely covered. Scoop out using a fork and place back on parchment lined baking pan. 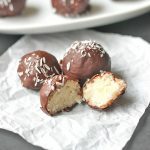 When all balls are covered, sprinkle with coconut and place back into fridge and chill until chocolate has hardened. Share with family and friends or keep them all to yourself. Store what’s left in covered container in the fridge.